All new users will need to create a user name to access online content and to post comments. New subscribers can choose between print+online or online only access. 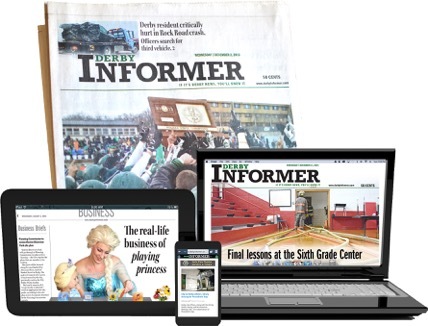 All print subscribers will also have access to all content on DerbyInformer.com. In order to activate the online portion of your subscription, you will need to create a user name and link it to your print account here. Your user name also allows you to comment on all news articles on the site. At the time of renewal, your online subscription will automatically renew, unless your print subscription lapses. All visitors will need to create a user name to access a limited number of news articles free and to post comments on the site. As a visitor, you will have 12 free news article views that will automatically renew every 30 days. After you have viewed 12 free news articles, you will be asked to choose an online-only or print + online package to continue reading. If you are a regular visitor, please consider an online subscription so you can have uninterrupted access to ALL content on the site.